Now is Your Time to Be Healed, Blessed and Uplifted! If you (or a loved one) needs physical or emotional healing – if you want peace of mind and peace in your life – if you want to be blessed with success and prosperity and ALL the goodness of life, then get this powerful audio MP3 recording of Rev. Ike speaking to you from Madison Square Garden! You may have watched the four powerful videos of Rev. 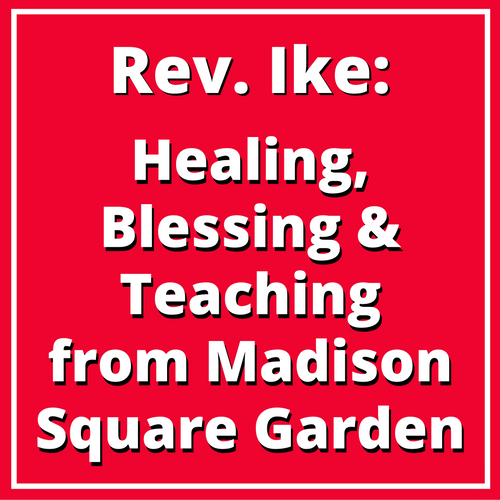 Ike at Madison Square Garden on YouTube, now we have combined these videos into one dynamic, emotion-filled, 20-minute audio MP3 titled: Rev. 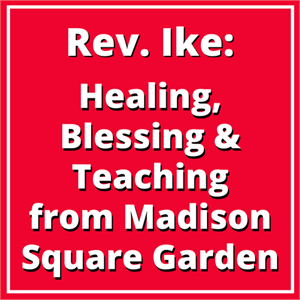 Ike: Healing, Blessing and Teaching from Madison Square Garden that you can download to have with you – to listen to whenever you wish – and to share with a loved one who may need healing! When you listen to this audio MP3, you will repeat powerful, life-changing affirmative prayer treatments with Rev. Ike, and when you do, you will feel the presence of God moving in your soul, mind and body, healing you – bringing you peace – and conditioning your consciousness to receive the blessings of success and prosperity that you richly deserve! Open Yourself to the Healing Virtue Within You! As you listen, you will join Rev. Ike in a powerful chant, saying YES to the presence of God within, to the POWER of God within – that will open you to the Healing Virtue within you, and you will let go – and let God have His wonderful way! Nothing really comes to you from outside of you – everything comes to you from within your own consciousness. Everything comes to you from within your own inner feeling about yourself. If you want to experience the very best of life, you must believe that you deserve the best! You will discover that, "anything that you can actually think and feel that you are worthy of must come to you." Whatever Good you Want, Get Full of the FEELING of It! Rev. Ike continues with this powerful teaching, "If you want to be healthy – all of your days in this dimension – in your consciousness, in your own mind, entertain the THOUGHT, the BELIEF, the FEELING of health." Then, Rev. Ike explains how to VISUALIZE with FEELING – and teaches you how to apply this wonderful technique to manifest whatever good you want – a new house or car – a better job – an education – a loving relationship! This is powerful stuff! Rev. Ike will turn you on, if you'll let him! Rev. Ike Speaks the Word of Healing and Blessing for You and With You! As you continue to listen to this audio, you will join Rev. Ike as he speaks the word of HEALING, the word of BLESSING for you, a powerful PRAYER TREATMENT that touches every child, every boy, every girl, every man, every woman under the sound of his voice – and even those who are in your hearts that you want prayer for! And as YOU repeat this moving, affirmative prayer aloud, with belief and conviction, you may feel the presence of the living God flowing through you, HEALING you and BLESSING you! Something Wonderful Happens, According to Your Belief! Rev. Ike then delivers a final blessing – a benediction to make smooth, beautiful and perfect your way! 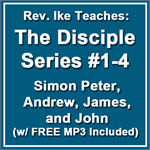 You will want to own this moving healing, blessing and teaching audio so you can have Rev. Ike with you whenever you wish, to comfort you – pray with you – support you – coach you and inspire you! 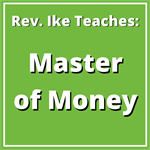 Because this audio is shorter than some of Rev Ike's other teachings (about 20 minutes in length) we are making it available for a special low price of only $3.95. A wonderful bargain! Order Now!